Pompous, epic, bombastic! Words that can easily describe the last decade and a half (or even more) in the long career of the Greek legend. 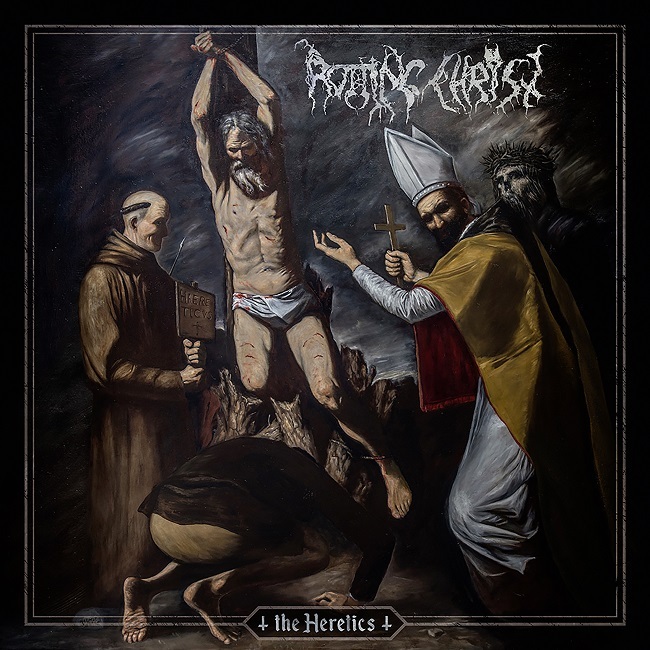 Every next outing of Rotting Christ has presented a new step in the direction they have chosen and this one bears the same mark. True, heresy is hardly a new concept in Metal music. Extreme Metal in particular. However, it is a rare opportunity that somebody tackles the subject in such a well-thought manner, especially when it comes to the compositional work. Almost at the same time as this album, there was a book published, written by Dayal Patterson (who also appears on this album) and Sakis Tolis, depicting (and demystifying) the band from the earliest days, up to this very moment. Now, we all know that Rotting Christ’s biography has been full of controversies. Not in the modern, tabloid way, but in the sense that their creativity has evolved far from the course set for them by the more narrow-minded fans. The book itself connects the dots and “The Heretics” serves as another proof that the Greeks are on the right path, despite what anyone might think. The trademark atmosphere and Sakis’ vocals are probably the only ties left to their Hellenic Black Metal origins. You can still clearly hear this music comes from an era that created the recognizable Greek sound. The only noticeable fault of this record might be that the same feeling runs through songs that have no thematic connection to Greece, like “Vetry Zlye”. Seems to me that more of a Slavic feel should be attached to such a piece. Still, it remains a good song throughout, showing another feat Rotting Christ use quite often, a fine choice of guests. Namely, on this particular track, Irina Zybina of Russian band Grai. The others being Ashmedi of Melechesh, Stratis Steele and already mentioned Dayal Patterson. As for the music itself, Greeks pretty much continue where they left off. Their songs are everything I have written on the opening of this review. Epic compositions, led by dark riffs and bombastic drumming, enhanced by the pompous vocals. Screams, chants and choruses take you through the themes of songs. Most of the album is based on marching, mid tempos, where the occasional speed-ups serve more as a curiosity than a regular characteristic of the genre. Another notable fact about Rotting Christ is that they make their tracks in such a way that you can easily lose yourself in the atmosphere they create. The songs are memorable, catchy, and one can certainly sing along to the tunes. Well, at least hum along, as not all the lyrics are in English. What I find interesting, about this band in particular, is that I can’t put my finger on their best album. Seems like they are keeping the bar set pretty high, without even thinking of mediocrity. There are no ups and downs with Rotting Christ, hence the army of loyal fans. While they might not have reached the peaks of popularity some of their contemporaries have, at least they have not offered us a bad album… Yet. Let us hope they don’t disappoint in the future either.